Snowdonia Cheese Company produces a selection of the finest cheese in the beautiful North Wales countryside. Wrapped in their signature coloured wax, and known for their unique melt-in-the-mouth texture and intense taste that echoes the drama of Snowdonia itself. 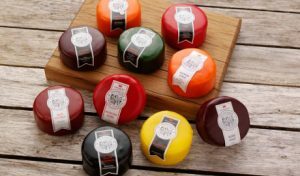 Each of our cheeses are carefully developed to have their own complex character and there are ten to choose from in our vibrant line up.